India and Myanmar held a foreign secretary-level meeting in New Delhi on Friday to discuss different issues, including Rohingya repatriation from Bangladesh. Indian Foreign Secretary Bijoy Keshab Gokhale and Permanent Secretary of Myanmar Foreign Affairs Ministry U Myint Thu represented both sides at the meeting. Security, defense, border, trans-boundary management, trade, connectivity and implementation of development projects came up for discussion, they said at a joint press briefing. The construction of residential houses was one of projects discussed at the meeting. They said to have discussed all relevant issues of the subcontinent. Although they did not utter the word “Rohingya”, it was implicit. Indian High Commissioner in Dhaka Harsh Vardhan Shringla also held separate meetings with two foreign secretaries on Friday. A highly-placed source said they discussed the repatriation of Rohingya refugees living in Cox’s Bazar of Bangladesh. Myanmar side reportedly agreed to take Rohingyas back within two years. Myint Thu told the meeting that a document as to identification of Rohingyas will have to be prepared. Every Rohingya family will be considered as a unit. 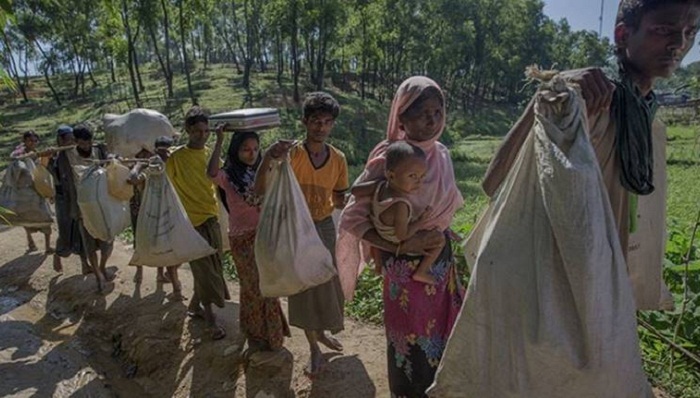 Myanmar has recently sent a list of 1,222 Rohingyas to Bangladesh. The officials concerned expect that repatriation process will start soon. India has granted Myanmar $25m line of credit for development of the troubled zone of Rakhine state. It is learnt that Indian External Affairs Minister Sushma Swaraj during her visit to Yangon last month assured Myanmar of increasing the amount of line of credit. This issue was also discussed at the meeting.